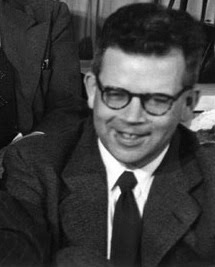 In 1963, a bizarre new class of Echinodermata was introduced to the world in the pages of Science by the two legendary invertebrate paleontologists J. Wyatt Durham, from UC Berkeley and K. E. Caster from the University of Cincinnati. Round, spindle-shaped body with a spiral coil. Free-living echinoderm with an expansible test!!! This weird thing could EXPAND like a frakkin' accordion. There are apparently hinges on the lateral plates that strongly suggest that these things would allow the test to expand!! Like a big pulsating heart or tomato!! How's THAT for blowing your mind away. 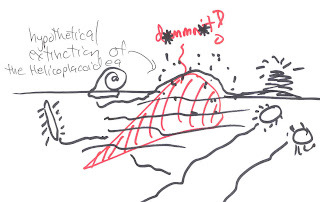 Helicoplacoids defied the conventional definition of what had been considered an echinoderm. 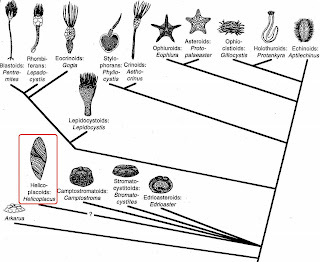 They were ASYMMETRICAL and did NOT have your typical echinoderm 5-part body plan. They did seem to clearly have the unique calcium carbonate skeleton (i.e., the stereom) that was unique to most echinoderms. Except that in these beasts, it was arranged into bizarre spiral patterns around the body. Hence the name "helico" meaning spiral or helix and "placoid" meaning plate. Ecology Its thought that helicoplacoids were suspension feeders, using several tube foot grooves which formed multiple channels leading up to the inevitable mouth somewhere on the body surface. You know things are getting weird, when people start debating where the MOUTH is located. 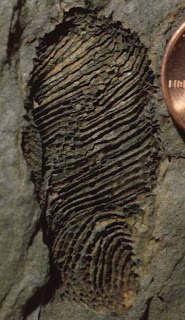 Helicoplacoids lived in the Cambrian. Why was this interesting? See this paper for a good summary. That's because, during this time, the physical environment of the world was VERY different from what it is today. 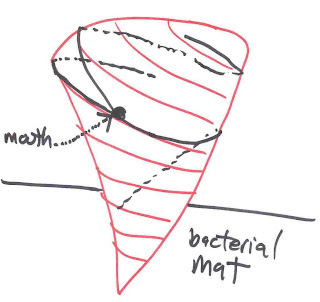 For example, the substrate (i.e., the dirt, sediment, mud, etc.) that these animals lived in was not very dynamic. Very still. Non-actualistic. 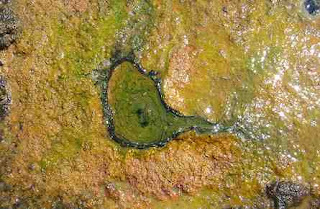 Plus, the surfaces of these bottoms were covered by "surficial microbial mats" and/or horizontal surface bioturbation. So, up until then, there were no little creatures burrowing up and down through the sediment. Nothing creating burrows. Nothing contributing to the dynamic fabric that is the substratum we know today. PLUS, it was covered in sort of a yogurt or cheese-like film or covering of MICROBES (what kind of microbes is another question). Helicoplacoids sat with the spindle-end down, essentially suspended in these bacterial mats like living, suspension-feeding potatoes! And because we spare NO expense in your education..here is a highly detailed graphic reconstructing how helicoplacoids may have lived. with mouth labelled. 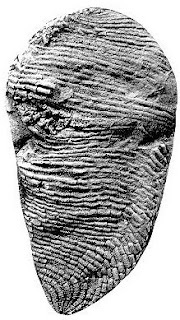 The black lines indicate feeding grooves, which were open to the water around them and were apparently absent on the surfaces of the body which were directed below the outward wurface.. Its thought that when all of this changed i.e., The Cambrian Substrate Revolution, began with the advent of bioturbation and the mixing of sediment by little critters, mixing up different layers of sediment creating little waves of sediment and water, etc. This began a major ecological shift that ultimately did no favors to the weird things that had become adapted to living there. Did it cause them to go extinct? Some believe so. Perhaps the most immediate question that arises is: How do you get such a funky looking animal? and how does it fit into the grand scheme of the Echinodermata?? To be sure, plenty of ideas exist. But one thing seems to be consistent across different phylogenetic ideas. Helicoplacoids occur down at the very base. 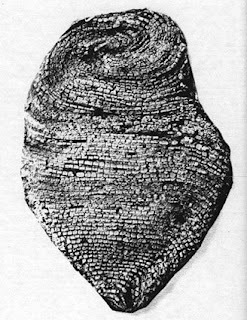 Early forms that explored morphologies specialized to very specific habitats. Thats just weird! You EchinoFREAKS! Your detailed illustrations made all the difference in understanding these ... things. The helicoplacoidea's ability to expand and shrink fits the mold of a precurser ability to the sea cucumber to do the same thing but even more dramatically isn't it? Perhaps rather than going extinct the helico... evolved into today's wide variety of sea cucumbers in response to the gradual change in the chemistry of the oceans coupled with the change in the bottom sediments you described. The derived evolved traits that might tie a cuke to a helico could be right in front for all to see, but seeing them takes a little bit of imagining perhaps? Also like a cuke, it's echinoderm symmetry could have been expressed internally, and the external appearance a result of the adaption to its environment. Echinoderms..So What Good Are They? Starro the Conqueror....hiding among us?? ?